Model T Ford Forum: What is it really? 1923 T? What is it really? 1923 T? Model T Ford Forum: Forum 2018: What is it really? 1923 T? Found this while browsing my local craigslist. Any ideas of the origin of the body? 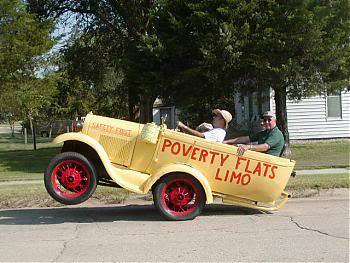 The chassis, or some of it, may actually be a 1923 Ford. But the body appears to be home made, possibly with seats from an early car or carriage. The top is also a creative exercise. One thing is certain. 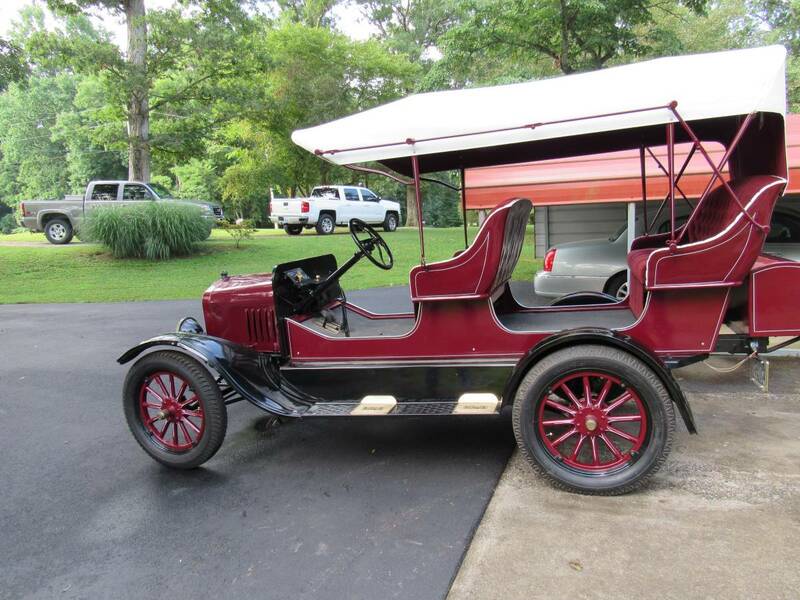 No Model T ever came from a Ford factory looking like this. Wow look at all that leg room! Yeah, leg room. I'm looking, I'm looking. I'm kinda liking the cathouse upholstery ! If you had a bed and breakfast on a lot of scenic acreage this would be a fantastic way to provide tours. Cute. Silly. Could be fun. A lot nicer than the supposedly '14 tourabout someone linked on another website a couple days ago. Reproduction buggy seats made of fiberglass are readily available off the shelf. That body, including the top, are probably recent creations - within the past 25 years. There are a number of buggy makers around the country who could have built that body for a customer. Found a YouTube video of the car. A fun homemade T built up from a 23-25 chassis. Too bad what is under the hood and that radiator does not match the fine job on the outside. Still kinda neat. Seat covers reminds me of a lot of Model A's that were done in the 70's and 80's. Wonder if he needs anymore legroom ??? A few beefy gals in the back and you'll have the front up like a clown car!! Tell Rob this is a model t prototype designed off of the model k. They must have had some tops left over. It�s weird, but hey, anything that can make people smile and ride in anything T powered is a good thing.